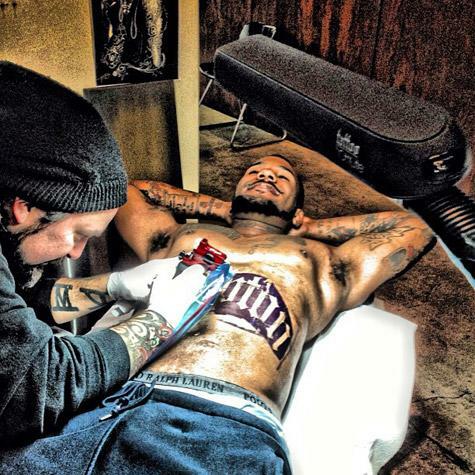 Game Gets New Stomach Tattoo Of "Compton"
Home>News> Game Gets New Stomach Tattoo Of "Compton"
Compton native, Game, has now payed homage to his city with permanent scarring. Game is not shy about professing his love for L.A., as evidenced by his face tattoo. But he's also repped his hometown of Compton hard, especially more recently, what with the Kendrick Lamar beef between him and Shyne. Now the rapper has taken his love for his hometown of Compton to a new level, with a new, larger tattoo. Game hit up tattoo artist Peter Koskela for the word "Compton" in Old English font across his stomach. This covered up his previous tattoo of "Stretch." Game tweeted about getting "Compton" tatted, "The stomach gotta be the most fucked up place to get tatted but I thugged it out." He also got a second tattoo done while there, but he has yet to unveil that one. 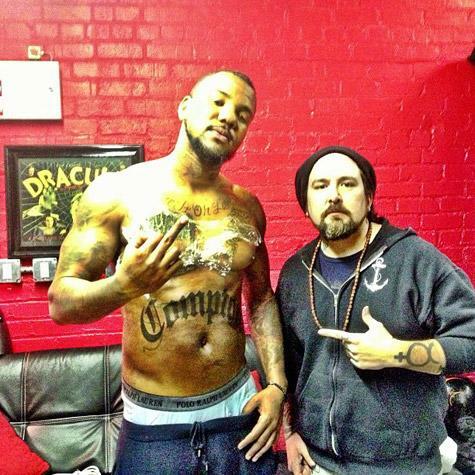 Check out photos of Game's new "Compton" tattoo below. Are you feeling it? NEWS Game Gets New Stomach Tattoo Of "Compton"